The Southern Tenant Farmer's Union (STFU) was an interracial organization founded in Arkansas on July 11, 1935, by sharecroppers with the help of the Socialist party. 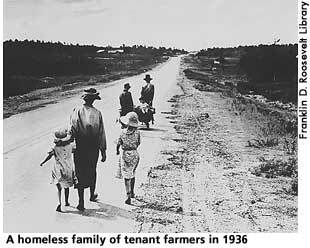 Its intention was to seek relief from the federal government for sharecroppers and tenant farmers, two groups that had clearly not benefitted from New Deal agricultural policies and that were growing more desperate as the depression worsened. The organization grew rapidly. It organized strikes aimed at increasing daily wages, sent delegates to lobby in Washington, and by 1936 had over 25,000 members across several southern states. As enrollment continued to increase, land owners began to harass and evict their tenants. By late winter, the conflict became very tense, as bellicose planters and impoverished sharecroppers began resorting to violence against each other. Government officials did little to alleviate the needs of the tenant farmers, until Rexford Tugwell brought the problem to FDR's attention in 1935. FDR created a new agency called the Resettlement Administration (RA) to aid the problem by improving cultivation techniques and resettling destitute farmers. Unfortunately, many of the RA's programs were long term and therefore had very little effect on the circumstances. The STFU began to take more action and a strike was planned for late August 1935. Thousands of sharecroppers struck against their planter landlords. At first, the owners responded violently, but pressed by the peak of picking season, they eventually agreed to a seventy-five-cent wage increase. The union called off the strike, workers went back to work, and the organization's national recognition grew. Although tensions temporarily abated, the violence between farmers and owners remained a persistent problem. Congress responded with the creation of the Farm Security Administration (FSA) in the fall of 1936. As part of the FSA, the Farm Security Corporation was established, which provided loans to poor farmers in an effort to enable them to purchase their own land. Unfortunately, these programs did little to alleviate the sharecroppers' burden, and with few notable successes after the 1935 strike, the organization faded from importance by the Second World War. Despite the support it received from Eleanor Roosevelt and other prominent liberals, the STFU could not dismantle the lock the planters held on federal farm aid and eviction and displacement of tenant farmers continued at a rapid pace. Organizers complained that the New Dealer "too often . . . talked like a cropper but acted like a planter." (1) However, the sheer ability of their organization to maintain interracial solidarity (if not ideological) against an unsympathetic federal government and a bellicose planter class was a remarkable development for an American South that otherwise remained segregated. Quoted in Robert MacElvaine, The Great Depression. (New York: Times Books, 1984), 262. Boyer, Paul S., et al. The Enduring Vision: A History of the American People. Boston: Houghton Mifflin Company, 719. Buhle, Mary Jo, et al., ed. Encyclopedia of the American Left. New York: Garland Press, 1990, 739-740. Cook, Blanche Wiesen. Eleanor Roosevelt: Volume Two, 1933-1938. New York: Viking Press, 1999, 4, 412. Lash, Joseph P. Dealers and Dreamers. New York: Doubleday, 1988, 222-223. MacElvaine, Robert. The Great Depression. New York: Times Books, 1984, 262. Watkins, T. H. The Hungry Years. New York: Henry Holt and Company, 1999, 384-391.